Renal biopsy is an important tool for the diagnosis of acute and chronic glomerular diseases in children. We aimed to analyze the spectrum of clinical indications and histopathological patterns (HPP) in children who underwent renal biopsy (RB). This is a retrospective review of case records of 108 renal biopsies carried out from January 2010 to December 2015 at the Pediatric Nephrology Department, National Institute of Child Health Karachi, Pakistan. RB was performed under Ketamine-Midazolam sedation and real-time ultrasound. Trucut or monopty biopsy gun was used. Data obtained included age, gender, clinical indications, biochemical, urinary, and HPP. Data analyzed by descriptive statistics using SPSS version 20. Of the total 108 patients who underwent renal biopsy, males were 56.5%. The mean age of children at biopsy and disease onset was 7.0 ± 4.28 (0. 2–17) and 5.8 ± 4.09 (0.1–15) years, respectively. Common indications for renal biopsy in primary glomerulonephritis (PGN) were steroid-resistant nephrotic syndrome (SRNS, 36.1%), steroid-dependent nephrotic syndrome (SDNS, 21.3%), and acute nephritic syndrome (ANS) with acute kidney injury (12.0%). Other indications were systemic lupus erythematosus with nephritis and Henoch-Schonlein purpura among secondary GN. Histopathological pattern in PGN showed focal segmental glomerulosclerosis (FSGS, 25.9%), minimal change disease (MCD, 22.2%), membranoproliferative GN (MPGN, 12%), and IgM nephropathy (7.4%). 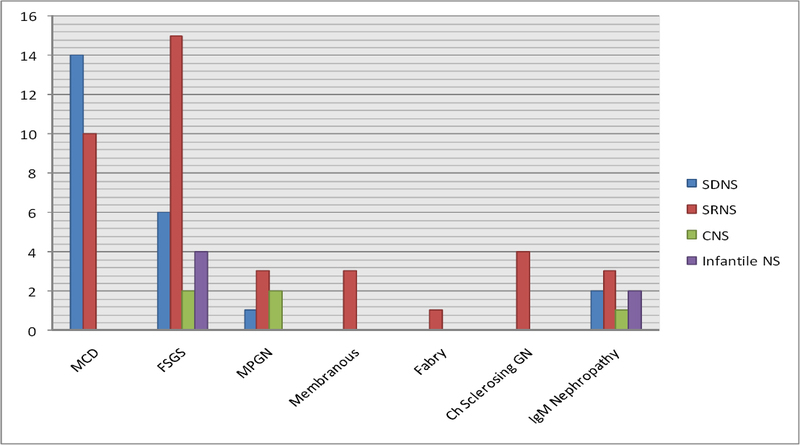 Lupus nephritis (7.4%) was the most common among secondary GN (SGN). Among 22 SDNS; MCD was found in 16, FSGS in four, and MPGN in two children whereas among 40 SRNS; 10 had MCD, 16 FSGS, and two had MPGN. We concluded that most common indications of renal biopsy were SRNS followed by SDNS and ANS. FSGS was the predominant HPP among SRNS and MCD among SDNS. Glomerular integrity is crucial for maintaining normal renal functions. Glomerular injury either due to genetic, non-genetic or as a part of systemic diseases is an important cause of glomerulonephritis (GN). Majority of these GN respond partially to the treatment and ultimately leave the patient on renal replacement therapies for survival. We aimed to analyze the spectrum of clinical indications, HPP and their clinicopathological association among children who underwent renal biopsy (RB) at one of the largest pediatric tertiary care hospital of the country. These included nephrotics showing steroid dependency, steroid resistance and acute GN with or without AKI having normal sized kidneys. We retrospectively analyzed the record of 108 pediatric patients who underwent renal biopsies for various indications from 2010 to 2015 at Pediatric Nephrology Department, National Institute of Child Health, Karachi. Indications of biopsy included steroid-dependent nephrotic syndrome (SDNS), steroid-resistant nephrotic syndrome (SRNS), acute glomerulonephritis with or without AKI, congenital nephrotic syndrome (<3 months of age) after exclusion of congenital infections, infantile nephrotic syndrome (3 months to 1 year) who behaved as SRNS or SDNS. Standard definitions of above clinical syndromes were used. Secondary involvement of kidneys in systemic diseases such as systemic lupus erythematosus (SLE), Henoch-Schonlein purpura (HSP) was also an indication of renal biopsy. All patients were assessed clinically, by laboratory investigations and renal biopsy. The following features were noted; age of disease onset, gender, duration from presentation to the biopsy, blood pressure, spot urinary protein to creatinine ratio, serum albumin, serum blood urea nitrogen, serum creatinine, microscopic or macroscopic hematuria and final histopathological diagnosis. Additional tests included anti-nuclear antibodies (ANA), anti-double-stranded deoxyribonucleic acid (anti-dsDNA) and serum complement 3 (C3) levels depending on the clinical suspicion. Kidney biopsies were done after informed consent from parents or guardians. Pre-procedure investigations included complete blood count (CBC), prothrombin time (PT), activated partial thromboplastin time (APTT), and hepatitis B and C profile. A pre-procedure ultrasound was done to confirm renal anatomy (number, size, and position of kidneys). Any ongoing infection or hypertension was optimized before procedure. All biopsies were done under ketamine and dormicum sedation by pediatric nephrologist under ultrasound guidance by the qualified radiologist. Either Trucut or automated spring-loaded biopsy guns with 16–18G needles were used depending on the availability. A minimum of two cores of renal tissue was taken in two or three passes. The tissue was sent in 10% formaldehyde solution for both histopathology and immuno-fluorescence to the Pathology Department of Ziauddin University Hospital, Karachi. Post-procedure patients monitored for gross and microscopic hematuria. The patient discharged 24 h post-biopsy after confirmation of the absence of hematoma formation on ultrasound. For light microscopy, tissue sections stained by hematoxylin and eosin, Masson’s trichrome, periodic acid–Schiff (PAS), and silver stains (Gomori’smethenamine silver). For amyloid-dosis, Congo red staining was done where required. For immunofluorescence, the tissue was stained by the direct method using fluorescein isothiocyanate (FITC) conjugated antisera monospecific for IgG, IgA, IgM, C3, and C1q (Dako, Glostrup, Denmark). The slides were visualized under the epifluorescence microscope and graded semiquantitatively as 0 to 3+ (on a scale of 0 to 3+, where 0 = absent and 3+ = brightest) and distribution described as membranous or mesangial in a granular or liner pattern. All data were analyzed using Statistical Package for Social Sciences (SPSS) version 20 (SPSS Inc., Chicago, IL, USA). Descriptive statistics were applied. Frequencies and percentages were used for categorical variables. Continuous variables were represented by mean and standard deviation. There were total 108 patients of renal biopsy; males were 56.5%, a male-to-female ratio of 1.3:1. The mean age at biopsy was 7.0 years, weight 20.3kg, and disease onset was 5.8 years. Demographic and laboratory parameters are summarized in [Table 1]. Table 1: Demographic and laboratory characteristics (n = 108). The most common indication of biopsy was SRNS 36.1%, SDNS 21.3% and acute GN presenting as AKI (12.0%). Acute GN with preserved renal functions were 7.4%, this group excluded proven poststreptococcal GN. There was 7.4% LN. One patient of systemic onset juvenile idiopathic arthritis (SoJIA) with nephritic range proteinuria was biopsied [Table 2]. The most common urinary finding was proteinuria in (84, 77.8%) of children while (26, 24.1%) of children had nephritic urine on presentation. Table 2: Clinical indications of renal biopsies (n = 108). The most frequent histopathological pattern was focal segmental glomerulosclerosis (FSGS) in 25.9%, minimal change disease (MCD) in 22.2%, membranoproliferative GN (MPGN) in 12%, and IgM nephropathy in 7.4%. The patient of SoJIA had renal amyloidosis [Table 3]. Table 3: Overall histological patterns in 108 renal biopsies. 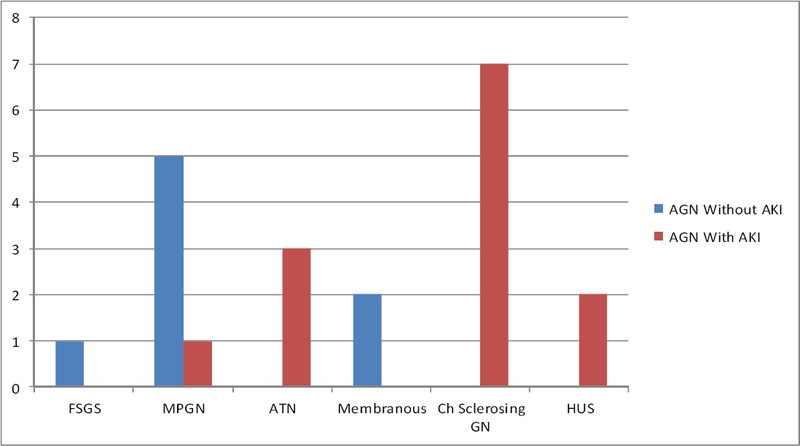 Comparing the clinical indications and HPP, FSGS was most common 15/39 among SRNS, while MCD was predominant among SDNS 14/23 [Figure 1]. On the other hand, chronic sclerosing glomerulonephritis was seen in 7/13 patients of acute glomerulonephritis with AKI, while MPGN was the frequent pattern 5/8 of AGN without AKI [Figure 2]. 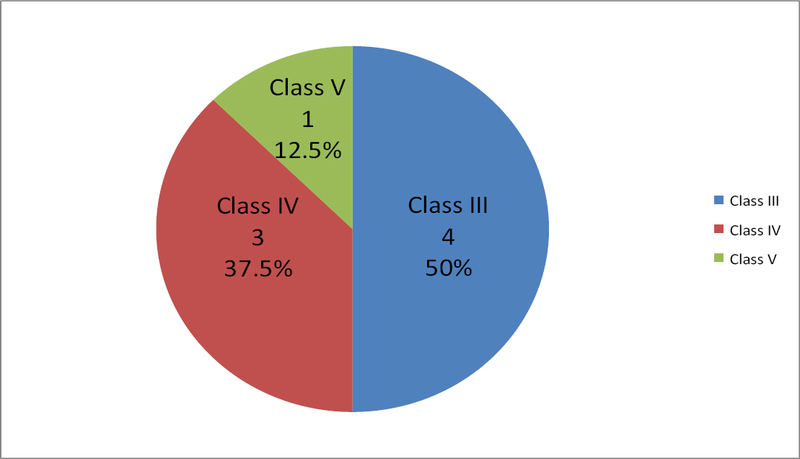 Lupus nephritis Class III was common among SLE [Figure 3]. Figure 1: Histopathological pattern among various clinical types of nephrotic syndrome. MCD Minimal change disease, FSGS: Focal segmental glomerulosclerosis, MPGN: Membranoproliferative glomerulonephritis, SDNS: Steroid-dependent nephrotic syndrome, SRNS: Steroid-resistant nephrotic syndrome. Figure 2: Histopathological patterns in acute glomerulonephritis. FSGS: Focal segmental glomerulosclerosis, MPGN: Membranoproliferative glomerulonephritis, ATN: Acute tubular necrosis, HUS: Hemolytic uremic syndrome. Figure 3: Histological variants of eight lupus nephritis biopsies. Among 108 patients, 91(84.3%) had no complication; hematuria which resolved within 24 h was seen in 13 (12%), only one patient developed local site infection. Hepatitis B and C profile were negative in all the patients. Serum C3 was low in 11 children. ANA and anti-dsDNA were positive in eight patients of SLE. The most common indication of renal biopsy was SRNS which is comparable to other cohorts such as Pakistan, Egypt, Turkey, and study.,, while it is in contrast to studies from Morocco where SRNS accounted for only 15% as an indication of renal biopsy and Serbia where SDNS was common., A significant proportion, approximately 20%, in our study was biopsied due to acute GN with or without AKI. We biopsied 5.6% of congenital nephrotic syndrome (CNS) which is comparable to results from Egypt and Morocco (5.4%)., The reason for getting high frequency of CNS could be explained on the basis of burden of referrals to our tertiary care pediatric hospital of all age groups from major parts of the country. The most frequent histopathological pattern was FSGS (26%) which is similar to the observation made by other studies from Pakistan, Egypt, North and South America and ranging from 15% to29%.,,,, MCD was the second common HPP in our study. In contrast studies from Morocco and Sudan reported MCD as predominant HPP., This variation could probably due to preference of clinical indication of biopsy on specific population. The limitation of our study is the lack of electron microscopic reporting of biopsies particularly the subtypes of MPGN. Nevertheless, our study gives a picture of prevalent histopathological pattern in our pediatric patients. The association of histopathological findings to genetic mutation is recommended particularly among our Asian population. We concluded that FSGS takes the major share of histopathological patterns among SRNS children and MCD is predominant among SDNS. We further conclude that chronic sclerosing glomerulonephritis is the most common HP in children presenting with acute glomerulonephritis with renal impairment. We would like to thank our procedural staff Mr. Michael Khokar and the sonologists Dr. Shakila Mansoor and Mahaira Fatima. Nochy D, Lefaucheur C, Bariety J. Renal biopsy: Methods. Nephrol Ther 2009;5:314-30. Gulati S, Sengupta D, Sharma RK, et al. Steroid resistant nephrotic syndrome: Role of histopathology. Indian Pediatr 2006;43:55-60. Habashy D, Hodson EM, Craig JC. Interventions for steroid-resistant nephrotic syndrome: A systematic review. Pediatr Nephrol 2003;18: 906-12. Moorani KN, Sherali AR. Histopathological pattern in childhood glomerulonephritis. J Pak Med Assoc 2010;60:1006-9. Lanewala A, Mubarak M, Akhter F, Aziz S, Bhatti S, Kazi JI. Pattern of pediatric renal disease observed in native renal biopsies in Pakistan. J Nephrol 2009;22:739-46. Mubarak M, Lanewala A, Kazi JI, et al. Histopathological spectrum of childhood nephrotic syndrome in Pakistan. Clin Exp Nephrol 2009;13:589-93. Mubarak M, Kazi JI, Shakeel S, Lanewala A, Hashmi S, Akhter F. Clinicopathologic characteristics and steroid response of IgM nephro-pathy in children presenting with idiopathic nephrotic syndrome. APMIS 2011;119:180-6. Swartz SJ, Eldin KW, Hicks MJ, Feig DI. Minimal change disease with IgM+ immuno-fluorescence: A subtype of nephrotic syndrome. Pediatr Nephrol 2009;24:1187-92. Bakr A, Eid R, Sarhan A, et al. Fifteen years of kidney biopsies in children: A single center in Egypt. Saudi J Kidney Dis Transpl 2014;25: 1321-7. Hadidi R, Hadidi M, alDabbas M. Spectrum of biopsy-proven kidney disease in children at a Jordanian hospital. Saudi J Kidney Dis Transpl 2014;25:680-3. Abdelraheem MB, Ali el-TM, Mohamed RM, et al. Pattern of glomerular diseases in Sudanese children: A clinico-pathological study. Saudi J Kidney Dis Transpl 2010;21: 778-83. Demircin G, Delibaş A, Bek K, et al. A one-center experience with pediatric percutaneous renal biopsy and histopathology in Ankara, Turkey. Int Urol Nephrol 2009;41:933-9. Souilmi FZ, Houssaini TS, Alaoui H, Harmouch T, Atmani S, Hida M. Indications and results of renal biopsy in children: A single–center experience from Morocco. Saudi J Kidney Dis Transpl 2015;26:810-5. Paripović D, Kostić M, Kruščić D, et al. Indications and results of renal biopsy in children: A 10-year review from a single center in Serbia. J Nephrol 2012;25:1054-9. Bonilla-Felix M, Parra C, Dajani T et al. Changing patterns in the histopathology of idiopathic nephrotic syndrome in children. Kidney Int 1999;55:1885-90. Piotto GH, Moraes MC, Malheiros DM, Saldanha LB, Koch VH. Percutaneous ultrasound-guided renal biopsy in children -Safety, efficacy, indications and renal pathology findings: 14-year Brazilian University hospital experience. Clin Nephrol 2008;69: 417-24. Mubarak M, Kazi JI, Shakeel S, Lanewala A, Hashmi S. The spectrum of histopathological lesions in children presenting with steroid-resistant nephrotic syndrome at a single center in Pakistan. Scientific World Journal 2012; 2012:681802. Printza N, Bosdou J, Pantzaki A, et al. Percutaneous ultrasound-guided renal biopsy in children: A single centre experience. Hippokratia 2011;15:258-61. Myllymäki J, Saha H, Mustonen J, Helin H, Pasternack A. IgM nephropathy: Clinical picture and long-term prognosis. Am J Kidney Dis 2003;41:343-50.